My name Sela Thul. I am 23-years-old. I was born into a farming family. My hometown is located in Saang district, Kandal province (Cambodia). I started school when I was 4-years-old. When I was in secondary school, grade 8, I became a Christian. I became an ICCM sponsored child in the House of Joy. I received a scholarship to a university. I wanted to get a scholarship to USA, but my English was not quite good enough. When I was in year 2 of the university, I formed my own startup called Tellsela service. It offers personal assistant service such as shopping, freelance tour guide, fixing things, etc. I couldn’t afford to pay someone to make a website to promote the Tellsela service, so I spent 3 months teaching myself a simple programming language. I really enjoyed exploring the technology field, but my dream was to travel. My dream was to explore the world. When I finished the university in 2015, I decided to work harder for my Tellsela service. My goal was to work, save money and then travel. Eventually I got work as a counselor at a summer camp in Vermont and I felt my dream came true. 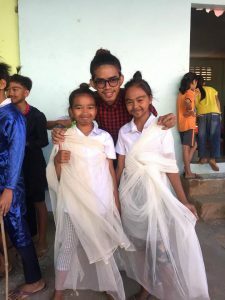 I enjoyed my travels, but I still remember when I came back to Cambodia to continue working on my Tellsela service and other projects which will benefit poor students. Thank you, ICCM, and my sponsors who helped make my dream come true! ICCM has helped change the lives of a lot of children who are as grateful as me. I would not be where I am or who I am without you!